2. Once logged in, click the "Get Offer" button and you'll be directed to the Target website to make your purchase. Note: If you're on mobile, scroll down and click on "View Desktop Site" to see the cashback button. 3. 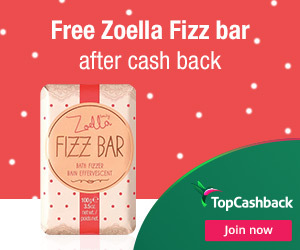 Add one (1) Zoella Beauty Fizz Bar Bain Effervescent Bath Fizzer priced for $4.50 to your cart and checkout. Do not add anything else to your cart. 5. In about 14 days $4.50 cashback will post in your TopCashback account. Offer valid through June 1, 2019.